It's been awhile since I posted any gratuitous yarn shots on a Friday. And boy do I have some beauties to show you today. 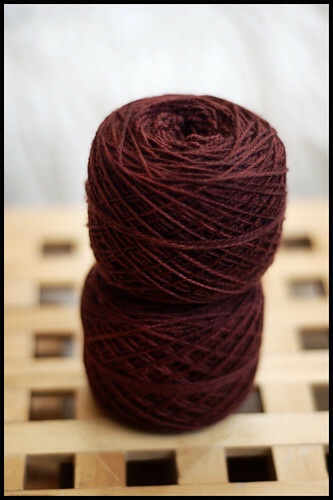 *Sundara Yarn. I think that's all there is to be said. :gasp: That is to drool over. How absolutely gorgeous! beautiful! Can you give some more details? Is it her sock yarn? Sport Merino? and in what colors? Enjoy! Your knitting and FOs take my breath away. Thank you. Gloriosky!! What gorgeous colors. I can hardly wait to see more. Hurry! They would definitely work well together. Yum! 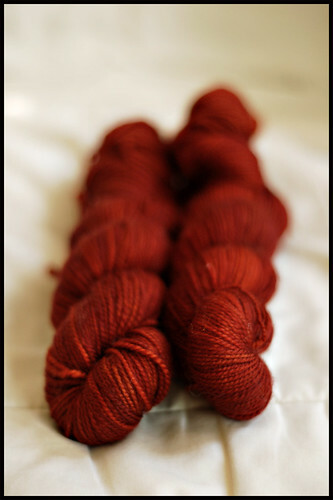 Those are some tasty yarn colours - they are spicy and fall-like. Wonderful recent FO, by the way, you do beautiful work. You also have a superb eye for photo taking - may I ask what type of camera you use? Have a great weekend! I have definitely become a Sundara yarn junkie. Could be worse, no? I'm drooling over that gorgeous russet in the middle, and that autumnal golden yellow really is perfect. Those colors are so beautiful together. It would look great in some colorwork. The yarn looks like it could make something beautifully delicate as well. I wonder what kind of combination that could be? What a gorgeous yarn! The colors are so rich. I think they would work beautifully together. 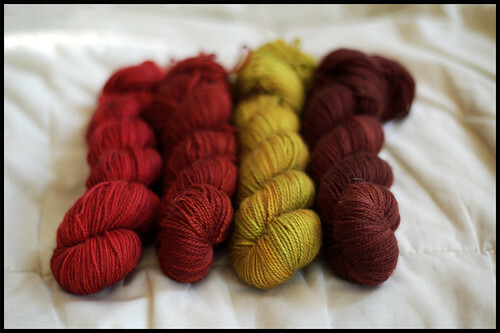 Gorgeous when combined, these colorways remind me of curries and tikka masalas. Your eye for color is fantastic...and I can't wait to see what you make with these. That gold and burgundy combo is rocking my face off! Such beautiful colours. I can't wait to see them knit up. About the previous post, best novice spinning I have seen. You are a natural! yum yum yum! I love the brown and russets! That is a lot of beautiful yarn! Those are some great colors. I can't wait to see what it is to become. that colour combo just screams fall to me! Am I have the perfect lipstick I could wear with them! Lovely... I can't wait to see what you create with it. Those reds are to die for! Yummy yummy yarn you're flashing! I love that one can see descriptive text when doing a 'mouse over' your photos! *Sigh* that makes me covet your yarn. How do you take such lovely pictures? So artistic! Lovely primitive colours (said I having just come from holidaying in Colonial Williamsburg)...scarlets and bricks and mustard and berries. Another lovely colour combination, as I recall, was Scott. How's that progressing? Un régal pour les yeux ces laines! J'en profite pour te dire en français ( car je ne suis pas suffisamment experte en anglais) que je trouve ton blog fantastique et qu'à chaque fois que je viens, je me régale! bravo! Do I smell Red Light Special 2.0? Love these Sundara colors! Reminds me of autumn! Is that you in the new IK preview? If so, congratulations! I came over to see if that was you in IK, too. Looks like your understated elegance. If that's you, congrats!! Beautiful colors! I keep missing the days Sundara yarns are available...aarrgghh! I'm guessing you are the jared for the new IK sweater!! 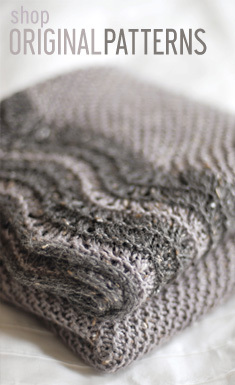 It sure speaks "Brooklyn Tweed"
Sundar means "beautiful" in Hindi, and judging from these pics, they certainly picked the right name for this yarn! Wow those are gorgeous! 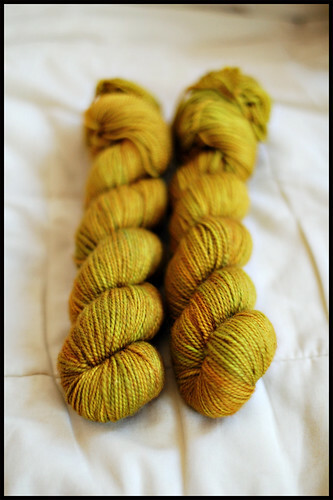 I have been hoping someone would be doing some more solid colors for sock yarn. 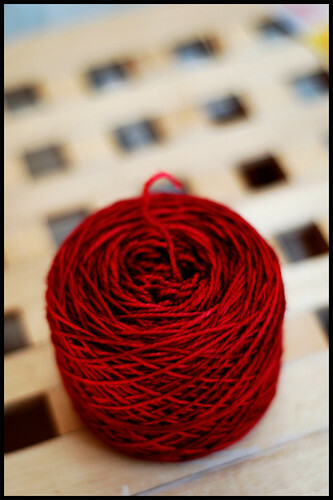 I've long admired your blog, so when I started my own knitting blog, I linked you. I hope you're okay with that! Its at http://nataliedanger.wordpress.com. 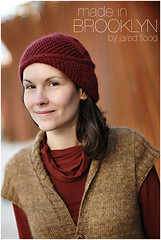 Is that your seater in the Fall preview for Interweave? Now ain't that Cobblestone pullover yours? GREAT! Congrats. It looks delicious by the way, has an air of becoming a classic. yes i wanted to congratulate you on your sweater in IK as well. i have no idea about your last name but the classic elite and the garter links back to you, doesn't it. and it is a lovely masculine sweater, i think. Awesome design ! Its in my ravelry que. Love it. Great job. All your yarn looks great!But that first one I am really loving that one!! Congratulations on the IK pattern. I knew it was yours even before I read the name. It's beautiful! I just saw your pattern in IK fall 2007. Congratulations! 23 people have already queued it in Ravelry.